Fennel is another one of those vegetables, like cauliflower, that gets a bit of a bad name. People have preconceived ideas about it. They don’t like it. But many have never tried it cooked. I may have been one of those narrow-minded people. 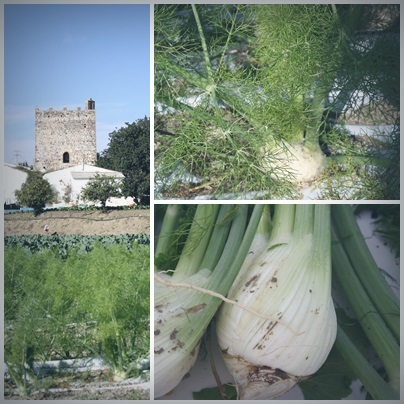 Running past this field full of feathery fennel fronds floating in the breeze in front of an 11th Century Moorish watchtower while Rufus begs me to turn around and run back because of the pack of very tiny dogs who bark (or actually yap) at his heels as we pass, made me want to research this undervalued vegetable a little more deeply. And by research I mean, look at recipes. On Pinterest mainly. Not that I’m addicted or anything but that is where I store all of the recipes I like the look of and want to make soon. The idea for this recipe didn’t come from Pinterest though. It came from Jim, The Washer Up’s dad. It’s not his recipe. I don’t think he stretches much farther than a ham sandwich in his own particular kitchen, but he does send me everything food related cut out from the British press, neatly folded in a brown envelope every couple of weeks. This is always a very welcome distraction, for me, from any cleaning that might need doing. It was in one of those envelopes that I found out about baking and stuffing fennel. Because I bought four whole fennel (complete with long feathery fronds still attached) from the farmer’s market on Sunday, I decided I wouldn’t waste all of that aniseedy greenery and I made a stock out of them for the risotto. This isn’t essential but if you have them, you may as well if you have the time. 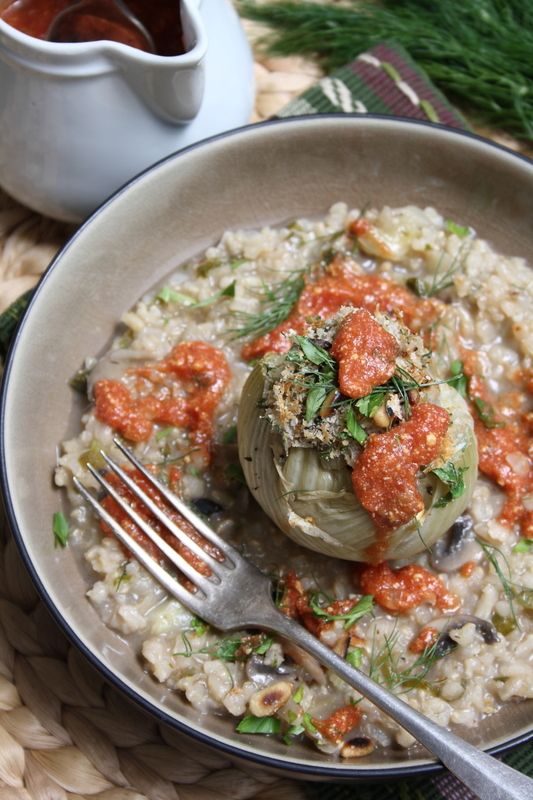 In the original recipe they stuffed the fennel with wild rice. I decided to make a risotto using brown rice and the mushrooms I had in my fridge and use that to stuff them instead. I have finally worked out how to make risotto from brown rice that actually looks and tastes like risotto. You have to part cook the rice first so it is nearly done. Then you add it to the risotto and continue as you would with uncooked risotto rice. It’ so much softer and creamier. I have to give credit to The Washer Up for this tip, he has been telling me to do it for ages. And he was right. There I said it. To make the fennel stock I cut the stalks and fronds off of the fennel bulbs and chopped them up roughly. I put them in a large pot with 3 or 4 bay leaves, 15 whole peppercorns and a good teaspoon of salt. Bring this to the boil then lower the heat and simmer, covered for about an hour. Taste and add more salt if necessary . Then drain and store in the fridge or freezer in 500 ml or 1 litre pots. You can just use a normal vegetable stock if you don’t have the fronds, time or inclination. Put the rice and stock/water in a pan. Bring to the boil then lower the heat, cover and cook for about 15 minutes until the rice is nearly cooked. Drain if necessary. Rinse under cold water if not using straight away to stop the cooking and set aside. Preheat oven to 180C. Cut about 2 cm off of the base of each bulb so it can stand up. Then cut another inch or so off of the tops. Remove any damaged/bruised outer layers. 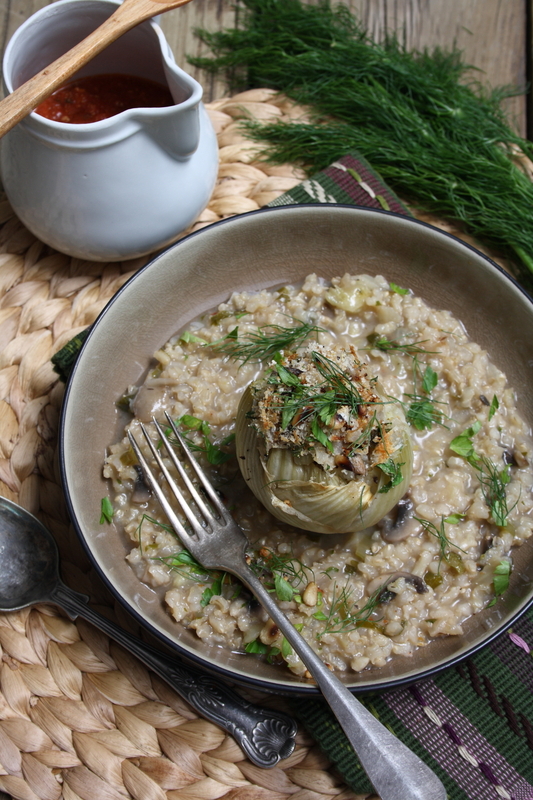 Using a teaspoon, hollow out the fennel bulbs as best you can (see picture above) reserving the fennel flesh for the risotto. 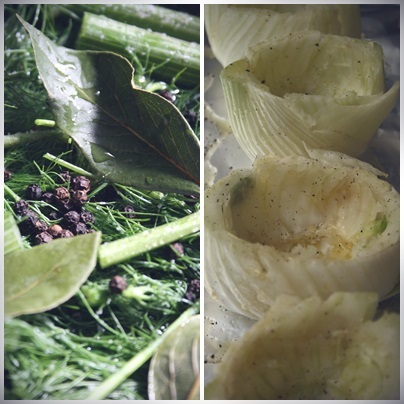 Stand the hollowed out fennel bulbs on a large sheet of foil, drizzle with olive oil and season well with salt & pepper. Start to bring the edges of the foil up and around the fennel then carefully pour in about 4 Tbsp white wine. Seal the foil package completely around the fennel but make sure that they are still standing. Bake for about 40-45 minutes until nicely softened. Put the stock in a small pan over a medium heat and keep hot but not boiling. Heat 2 Tbsp olive oil in a large pan over a medium heat, add the onion, celery, chopped fennel and a pinch of salt and cook for about 4 minutes until softened but not browned. Then add the garlic, thyme, chilli flakes, half of the lemon zest and cook for another 2 minutes. Add the mushrooms, cook for three minutes until softened then add the part cooked rice. Add a good splosh of white wine and cook until evaporated. Season well with salt & black pepper then start adding the hot stock a ladleful at a time, waiting for it to be absorbed before adding the next ladleful, stirring and swirling occasionally. Keep going until you have used all the stock and the rice is cooked. The risotto should be soft and quite liquidy. Add a squeeze of lemon, a little of the chopped parsley and stir in the 30 gr grated manchego/parmesan. Turn off the heat, put a lid on and leave for 3-5 minutes. Heat up your tomato sauce. 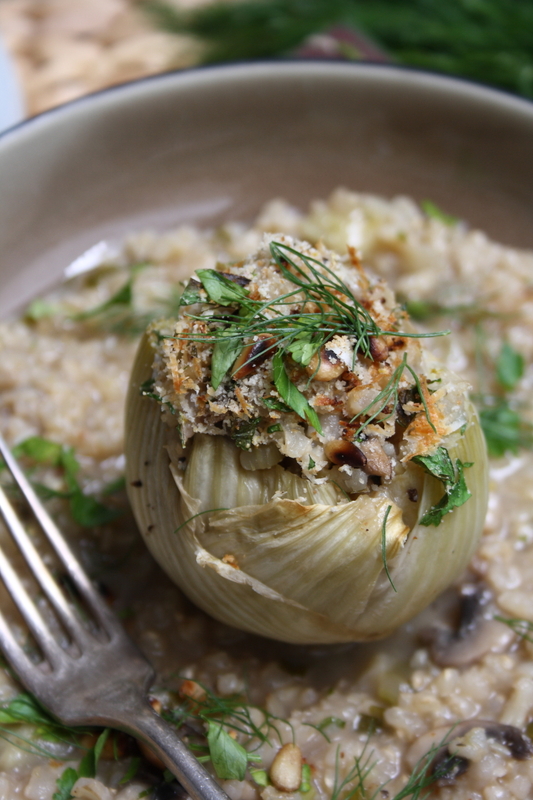 If your fennel bulbs are done remove them from the oven and put the grill/broiler on high. Mix together the breadcrumbs, grated manchego/parmesan, rest of the lemon zest, some pine nuts & some chopped parsley in a small bowl. Check the risotto for seasoning add more salt if necessary. 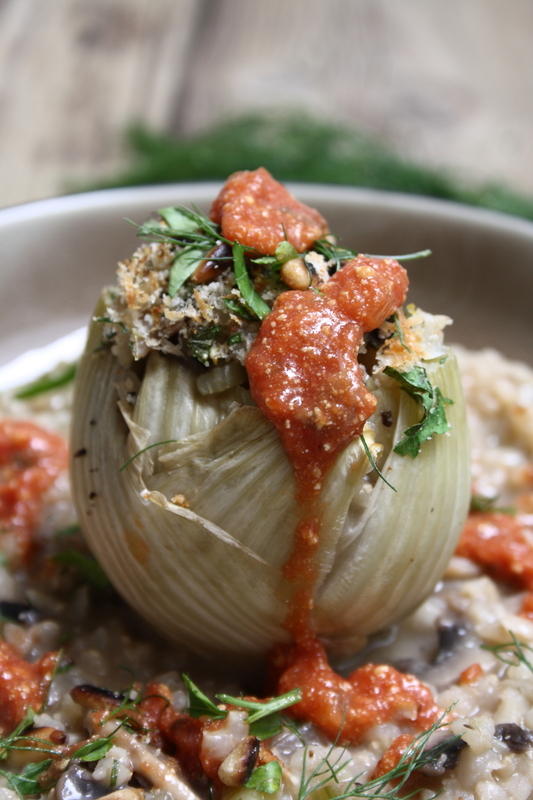 Spoon some risotto into each fennel bulb right to the top and a little bit more, sprinkle over the breadcrumb mix and put them under the grill for a minute or two until browned. 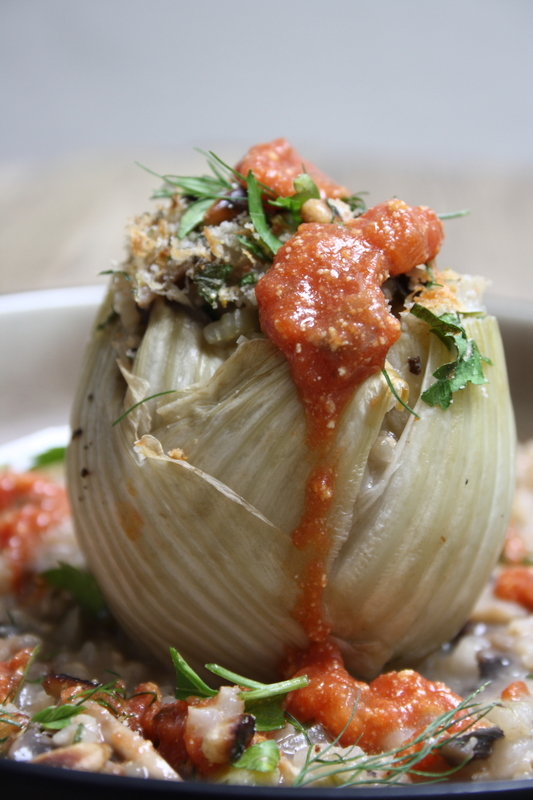 To serve: Cover the base of each dish with a shallow pool of risotto and place the stuffed fennel in the middle. Spoon some of the tomato sauce on and around the dish and garnish with some of the breadcrumb mix if you have any left, some chopped parsley or fennel fronds. As you know I get most of my food inspiration from the fruit & vegetables I see growing in the fields where I walk with the dog in the morning. There are hundreds of these peppers everywhere. This time of year there is always a glut of tomatoes. So much so that they are basically being given away or left to rot on the ground. This whole field of corn is being left to dry out completely. The corn was ripe about a month ago but has not been harvested. I don’t know why, I’m hoping that they are going to use it to make corn flour or something. It seems such a waste. My scotch bonnet chilli pepper plant is still producing more chillis. I have 3 large tubs already in the freezer and it has just flowered again which means another crop. I have just been back to England for a few days for my mum’s birthday. As usual I had to buy another cookbook while I was there. This time I decided to go for something Caribbean as I have so many Scotch Bonnets to use. The book is Spice it Up by Levi Roots. There are lots of recipes I’m eager to try but his Caribbean chilli was the first one because it used a lot of stuff I had to finish up in my fridge. I love recipes like this It’s so versatile. I added the sweetcorn and used lentils instead of kidney beans as that is what I had. I also have a really healthy thyme plant on my terrace. It’s not woody at all so you can use the whole sprigs for seasoning as well as the leaves. Fresh thyme is used a lot in Caribbean food. So you can kind of see how my brain works. The stuff I see growing while walking the dog stays in my head. It gets added to the things I have on my roof terrace and inspiration from books brings it all together somehow. It’s this creativity that I love and that keeps me cooking and writing this blog. So I made the chilli which was delicious on its own with some rice or cornbread and then used the rest to stuff into the green peppers for lunch the next day. A sprinkling of grated cheese before roasting gives it that something extra and takes it in a slightly more Mexican direction. For that late summer vibe you can’t beat a bit of Caribbean spice. 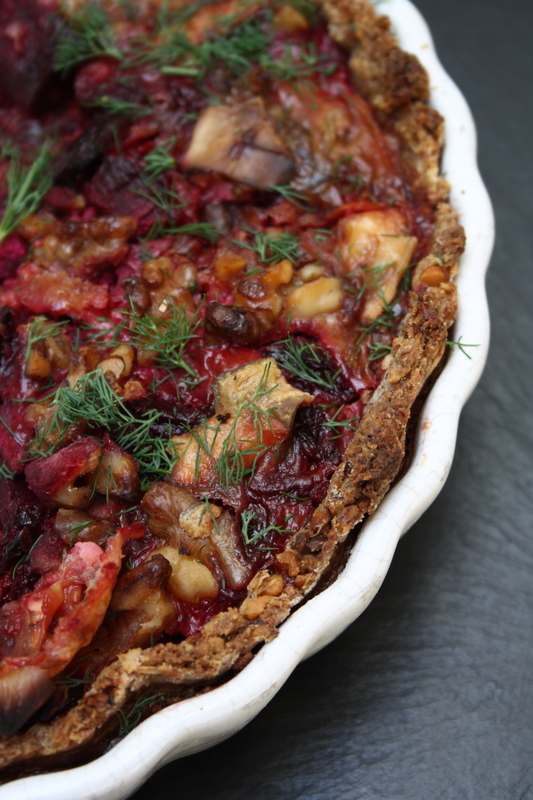 So if it’s rainy where you are, bring on the sunshine, get creative and start cooking. Serves 4 as chilli, 6 for stuffed peppers, vegan, vegetarian, gluten-free. Heat the oil in a large saucepan over a medium heat. Add the onion, leek, celery, carrot & garlic and cook for about 5-8 minutes until softened. Season well with salt & pepper and add the cumin, allspice and fresh thyme leaves, stir and cook for 2 minutes. Next add in the peppers, cook for 2 minutes then add in the mushrooms and cook for another 2 minutes, stirring occasionally. Add in the chopped tomatoes, chillis, sweetcorn, lentils & beans and stir well. Then add the tomato puree, sugar & soy sauce. Lower the heat, cover and cook over a low heat for about 30 minutes, stirring occasionally. Taste, add more salt, sugar or cayenne pepper if not hot enough for you. Stir in the chopped coriander and squeeze over the juice of 1/2 a lime. Serve straight away with plain boiled rice or some cornbread or use to stuff peppers. Preheat the oven to 180C. Cut the peppers in half lengthways and remove the seeds and core. Line a baking tray with baking paper and place the peppers on the tray. Drizzle with olive oil and season with salt, pepper, thyme leaves and chilli flakes, toss to coat. Roast in the preheated oven for 25 minutes, you can do this while your chilli is cooking if you like. When the peppers are cooked spoon the cooked chilli into the peppers and sprinkle over the grated cheese. Put back in the oven for another 5-10 minutes for the cheese to melt. Cook for 15-2o minutes if the filling is cold. Serve on their own or with a simple green salad. Things That Made Me Smile Today……..
My best friend Tara, who I miss a lot, made dinner for me when I was back in England. I’ve never seen her cook before so I was very honoured!! Especially as she made my White Bean Dip as well as a Blue Cheese, Pear & Walnut Salad, Nachos and some delicious Spicy Roasted Potatoes. It was far too much food for the two of us but we still managed to polish off some Baklava and a bottle of pink champagne. She has two gorgeous Chihuahuas, a boy & a girl called Rocky and Coco. Rocky is the white one and Coco is brown. I don’t usually like little yappy- type dogs but they are so cute. Thanks T, I miss you. Come and see me soon!! This is a bit of a mish mash of different mezze & tapas dishes that I wanted to try. I bought a tin of whole roasted peppers after seeing Jamie Oliver stuff them with ground almonds, Manchego cheese and breadcrumbs for one of his 30 Minute Meals. This is a tin of Pimientos del Piquillo. This is taken from Iberia Nature “Pimientos del piquillo (piquillo peppers) come from Navarra. These small red peppers are charred over wood charcoal or old vines, then peeled by hand, marinated in olive oil with herbs, and eventually eaten either alone, in a salad or stuffed. The flavour of canned or jarred piquillo peppers is so extraordinary Alain Ducasse, Daniel Boulud, Ferran Adrià and many other famous chefs use them. Indeed 99% of Spain’s cooks (amateurs or pros) use canned or jarred piquillos. In general, I’d never recommend a canned product over a fresh one, but in this instance I will. In the case of piquillos, the essential flavour may actually be enhanced by the preservation, and the texture is definitely improved”. Here in Andalucia one of the most popular ingredients used for stuffing the peppers is Bacalao, (salt cod) mixed with a kind of bechamel sauce. I have been caught out before in tapas bars when we first came here thinking the stuffing was mashed potato because that is what it looks like. Also when you ask most Spanish people if something is vegetarian they say yes even if it contains fish. I have always wanted to make a my own version of this dish as it looks so appealing. I used some leftover mashed potato mixed with Jamie’s ground almonds, Manchego cheese, breadcrumbs and sherry (Jerez) vinegar to create the stuffing and used a piping bag to fill them. Much easier than trying to do it with a spoon. Another recipe I’ve been wanting to try for a while is Foul Mdammas. A Middle Eastern dish made with fava beans/broad beans, tomatoes, lemon juice herbs & spices it is a fresh & seasonal salad. The recipe came from the beautiful Orange Blossom Water . I used frozen broad beans for this recipe which I peeled after cooking but you don’t have to. I just prefer the bright green colour and don’t really like the texture of the outer skins. I topped my Foul with some crumbled Feta because I couldn’t resist. I haven’t made Hummus for a long time which is strange because it used to be my favourite thing. I think I may have OD’d on it slightly. It wouldn’t be an exaggeration to say it was all that I ate for a long time when we had the restaurant. I didn’t have time to eat properly so I would just grab some crackers and hummus. I, not surprisingly, got sick of it and never wanted to see it again. I think I am now ready to rediscover it’s charms as a delicious, nutritious snack high in protein, fibre and iron. Of course you need some sort of bread on a mezze / tapas plate. Something to use as a vehicle for all the delicious goodies. A scoop or shovel, if you like, to carry the food to your mouth. I bought some Atta the other day which is a soft wholemeal flour used for making chapattis. This was the perfect excuse to debut the new purchase. I followed the recipe on the back of the flour packet and added in the flavours from my Leek & Fennel Seed Flatbreads to spice them up a bit. So there you have it, my justification for the fabulous fusion of flavours on one plate. I’ve said it before, the southern coast of Spain is only eight miles from Morocco at the narrowest point across the Atlantic. Well that’s my excuse anyway…. Preheat the oven to 200 C. Put the cold mash, manchego, almonds, chopped rosemary, Jerez vinegar, salt & pepper into a processor or bowl and blend until incorporated. Taste for seasoning. Put the mixture into a piping bag (or freezer bag with a corner cut off) and pipe the mixture into the peppers until full. Put in an ovenproof roasting dish, sprinkle with breadcrumbs, some chopped rosemary and drizzle with olive oil. Bake in the preheated oven for about 20 minutes. Cook the beans according to the instructions on the pack, drain under cold water and peel when cool enough to handle. You don’t have to peel them but I think it tastes much fresher. Add the rest of the ingredients apart from the garnish and mix well. Check seasoning and serve garnished with extra parsley leaves & some crumbled Feta if you like. Put everything (except sesame seeds & chilli oil) in a food processor or bowl and blend until smooth. Taste and add more salt/lemon juice/tahini/olive oil if required. Hummus is such a personal thing you need to tailor it to your taste. Blend again and store in an airtight container in the fridge. When ready to serve, sprinkle with toasted sesame seeds and a little chilli oil (or olive oil). Heat the olive oil in a frying pan over a medium high heat. Add the fennel seeds and when they start to pop add in the leeks, chilli flakes a pinch of salt and black pepper. Saute for about 3 minutes until the leeks are cooked and slightly browned. Set aside to cool. Put the flour into a large bowl with 1/2 tsp salt and mix. When cooled stir the leeks through the flour to distribute evenly. Add cold water bit by bit until you have a stiff dough and it stays together in a ball. Knead the dough for 3 or 4 minutes, wrap in clingfilm and put in the fridge for at least half an hour. Divide the dough into four balls and roll each ball out on a floured surface to about 2 or 3 mm thick. Heat a frying pan over a medium heat and cook the chapattis turning frequently until golden brown. Rub with a little oil or ghee and keep warm under a clean tea towel (or warm oven) while you cook the rest. Serve immediately. This is the gorgeous stuffed/pull apart bread I served with my Persian Lentil & Herb Soup. I was very pleased (understatement) with how it turned out because I do not have the best of luck with yeast. Every time I have used it in the past I have a disaster. It never does the double in size thing (in a warm place) and won’t rise in the oven either. My attempts at Panettone were tasty but looked more like a tea cake than a light and airy Panettone. This may have been because the electric went off half way through cooking it both times! I had sworn off making anything with yeast until I came across this recipe for Halloumi Pull Apart Bread. The idea of pulling apart soft bread rolls to reveal an oozing cheesy garlic centre was too much for me. I was powerless to resist. Think Pizza Express dough balls, Pizza Hut stuffed crust and the best cheesey garlic bread then mix them all together and this is what you get. A Halloumi & Garlic Stuffed Dough Ball Ring…………. ! 150 gr mozzarella, grated (good for stringy melting)! In a small bowl combine the yeast, sugar and olive oil. Pour the warm water over, stir to combine then leave it for 10 minutes. Sieve the flour and salt together into a large bowl. When the yeast mixture has gone foamy pour it into the flour and stir together using a wooden spoon until it comes together into a dough. Sprinkle over some more flour if it is very sticky. Flour your hands and ease the dough out onto a work surface. Pat it into a ball and knead for 10 minutes, flouring if necessary, until it becomes smooth & elastic (You can test if it’s ready by sticking your finger in flour then sticking it in the ball of dough. The hole should spring back up and disappear). Lightly oil a large bowl and turn your dough around in the bowl to cover it in a sheen of oil. Cover the bowl with cling film or a clean tea towel and leave in a warm place (like next to a radiator) for about an hour. By this time it should have doubled in size (fingers crossed). Mix the cheeses, parsley and minced garlic in a small bowl with a fork to make sure the garlic is evenly distributed. Roll the dough out of the bowl onto your work surface and gently knead a few times to get rid of any air pockets. Pinch off a piece of dough about the size of a golf ball. Press it out with your hands to an uneven circle of about 3.5 inches in diameter. Place a generous heaped tablespoon of the filling into the centre of the circle then gather up the sides of your circle and pinch them together at the top like a little drawstring purse. Put the gathered purse seamside down in the palm of your hand and, with your other hand, gently turn, press and smooth the ball until it becomes smooth and the seam has closed/disappeared. Put a few tablespoons of olive oil in a small bowl and dip the top of the dough ball in the olive oil, then put it (seam side down) in a lightly oiled 24 cm (9 inch) cake tin. Repeat with the rest of the dough until the ring is finished. Keep some of the filling back to sprinkle over the bread later. The dough balls should be close together or lightly touching, not squashed together. You should get 11 or 12 out of the dough. Cover with clean tea towel and leave to rise again (in a warm place) for an hour. While the dough is rising, preheat your oven to 210 C (425 F). Put one rack/baking sheet in the bottom third of your oven and put the other rack /sheet right at the top. Put a rimmed baking sheet on the top rack. When the dough has risen (see above, hooray!!) slide the bread ring onto the lower rack and throw the ice cubes onto the top baking sheet and close the door. This creates steam, helps the bread to rise and makes a nice crust apparently. Bake for 25 – 30 minutes until it is lightly golden but not fully cooked and sprinkle over some of the cheesey garlic & herb mix. Put it back in the oven for another 5 – 10 minutes until it is puffy and golden brown. Leave to cool slightly (if you can wait) and pull apart chunks of the cheesey bread to serve with your favourite soup. Or just eat it on its own as an indulgent weekend treat with friends in front of the TV…… Is it the Superbowl this weekend?!!! It’s all about the Butter Bean Puree. You can serve it with whatever you like. Think about a mix between hummus & mashed potato and you’re almost there. It is comfort food heaven for me. The beans are pureed with roasted garlic, lemon juice, olive oil & rosemary and served hot, like a beany, garlicky mash. They are the perfect accompaniment to any Italian, Spanish, Greek or Middle Eastern dish. Or just eat it on its own from the bowl with a big spoon…. Preheat the oven to 200 degrees. Slice the tops off of the peppers, cut out the seeds and pull out any white membrane. Stuff the peppers with the risotto (or whatever you are using), top with the crumbled feta and sprinkle with oregano. Put the peppers in a foil lined baking tin with the unpeeled garlic cloves. Sprinkle the breadcrumbs over the feta and drizzle the tops & garlic with olive oil. Bake the peppers in the preheated oven for 35 – 40 minutes but take the garlic cloves out after 15 minutes. Put the rinsed beans, lemon juice and rosemary in a bowl then squeeze the roasted garlic out of their skins into the bowl as well. Drizzle with 1 or 2 tbsp of extra virgin olive oil and blend with a stick blender or in a food processor. Drizzle in the rest of the oil while blending until you have reached a kind of sticky mashed potato consistency. Season well with salt & black pepper, taste and add more lemon juice if you want. Add more olive oil if you want it more liquidy. Heat the bean puree in a pan and serve drizzled with olive oil & a sprig of rosemary garnish. This Butter Bean Puree is quicker, easier and, dare I say it, more delicious than mashed potato. A really great side dish to do when entertaining, or just for yourself, you may not want to share it…! The artichokes growing where we walk the dog are looking pretty ready and they are a really good price in the market now so I bought a couple. I have never eaten artichoke before let alone cooked with one so I was a little nervous about preparing them- it looks complicated! The artichoke globes are so pretty when you buy them like green & purple prehistoric looking flowers. It seems a real shame to pull all the leaves off when you want to cook them. This is how the artichokes start out but by the time you have cleaned them down to the hearts, you are not left with much. You can understand why they are expensive to buy in jars. If you want to know how to clean an artichoke look here. I would definitely recommend buying more than two! I thought one each would be plenty for a risotto but you don’t get left with much so I added some mushrooms to bulk it out a bit. The artichokes get soaked in lemon water to stop them discolouring so I decided to follow that flavour through in the risotto as well. The combination of artichoke, mushroom & lemon worked really well, I added some fresh parsley too..
at least 2 artichokes (4 would be better) you could use some from a jar of hearts. When you have prepared your artichokes (see above) put them in a bowl of water with the juice of 1/2 a lemon. Heat the oil and butter in a large pan and cook the onion and garlic over a medium low heat for about 5 minutes until soft but not browned. Chop up your artichoke hearts, add them to the pan with the mushrooms and a spoonful of the stock and cook until the chokes are tender about 5-8 minutes, add a bit more stock if it dries up. Turn the heat up, add the rice and lemon zest & stir to coat the rice. After a minute or so add the wine and leave it to absorb into the rice. Season with salt & pepper. Meanwhile put the veg stock in a small pan and bring to the boil the turn it down to a simmer. Add a ladleful of the hot stock to the rice, stir or swirl until all the liquid has been absorbed. Continue adding the stock, a ladleful at a time, stirring until each ladle has been absorbed. About 18-20 minutes. When the rice is just cooked turn off the heat, add the other 1/2 lemon juice, the chopped parsley and the grated cheese. Stir to combine, put the lid on and leave it for 2 minutes. If﻿ you are lucky enough to have some, crumble over some Lancashire cheese, so delicious with it and the lemon really highlights the flavour of the artichokes. This was my first attempt cooking with artichokes and it won’t be my last but I will definitely buy more next time, or maybe a jar of hearts!! We had some risotto left over as I always make too much. I like to do this , it means you can get creative for lunch with the leftovers. We had some lovely long green peppers in the fridge that were just crying out to be stuffed, I added a little chopped green chilli to the risotto for a little heat and piled the mix into the halved and deseeded peppers. I crumbled over some Lancashire cheese but you can use whatever you have, Feta or Parmesan would be good. Then sprinkle with a few breadcrumbs, drizzle with olive oil and bake in a 200 degree oven for about 25 minutes until the peppers are collapsing slightly and the cheese & breadcrumbs are golden brown. Serve garnished with lime wedges to squeeze over and some fresh coriander or parsley. The lime juice brings all the flavours back to life, enhances the green chilli and sends it down Mexico way… Enjoy!